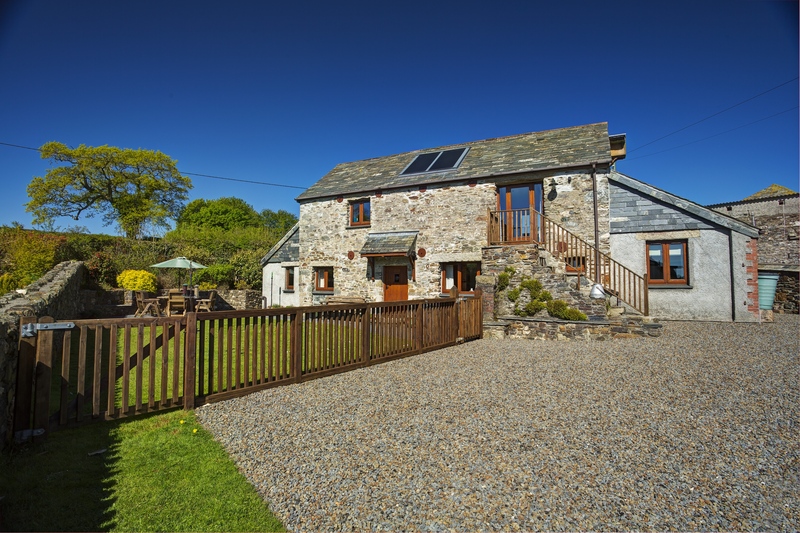 The barn has been carefully converted by an excellent local builder giving a unique feel to the property with many character features. The open plan first floor living area has exposed oak A-frames, wooden floors and beautiful views across the patchwork of local farmland with Dartmoor in the distance. The lounge has a digital TV, DVD player, comfy seats and a selection of books, games, toys and DVD’s for guests to use. Free broadband is provided. A large kitchen area has been fitted with electric hob and oven, microwave, dishwasher, fridge, freezer and washer dryer. The french windows open onto the original granite steps which lead down to a large garden, patio and parking area. The ground floor benefits from underfloor heating and porcelain tiles throughout. The master bedroom has a kingsize bed and an ensuite shower room and wc. The twin bedroom has 3 foot beds which can be zipped and linked together to form a very large double on request. There is a further single bedroom with a pull out 2′ 6″ bed available. The family bathroom has a large bath with a shower over it. The holiday let has been inspected by Quality in Tourism and has been awarded 4 star GOLD status for the past 7 years. Please check out the reviews from our guests. You can check availability & book online safely and securely on our website.